The provinces Overijssel, Limburg and Zeeland have added new acts to Genlias. The Utrecht Archive opened a new online database: Stadsbestuurders Utrecht (City administrators Utrecht), with data on all mayors, aldermen and council members from 1813 to 2006. Administrators from before 1813 will follow later. 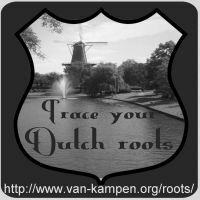 The search interface of the Rotterdam Digital Family Tree is now available in English. The City Archive of The Hague published the council accounts of the The Hague city archive (1855-2005) on their website. In April I found online The Utrecht Archive, ironically when I was in a Dutch hotel surfing the Internet. My (Le)Marchand ancestors were in Utrecht/Vianen in the 18th century and I have found several documents relating to them. I now also have for the first time the names of my 6 x great-grandparents! An excellent website, thank you - and more to come. Found some BMDs in Genlias, too. I am looking forward to more results in the future.